On board the inland vessel MTS Kroonstad we are going to install a horizontal 2300 kW fired thermal oil boiler. It is equipped with a secondary system (with a heat exchanger) to be able to provide for the heating of the twelve cargo tanks. The whole system meets the applicable ATEX safety requirements. The expansion vessels will be placed on top of the deck of the inland vessel and are equipped with EX instrumentation. The secondary pump is equipped with an EX electric motor and will also be placed on top of the deck. The thermal oil installation is controlled by a PLC control panel. The advantage of this type of control is that the switch cabinet can be checked from the wheelhouse. Safe and efficient! 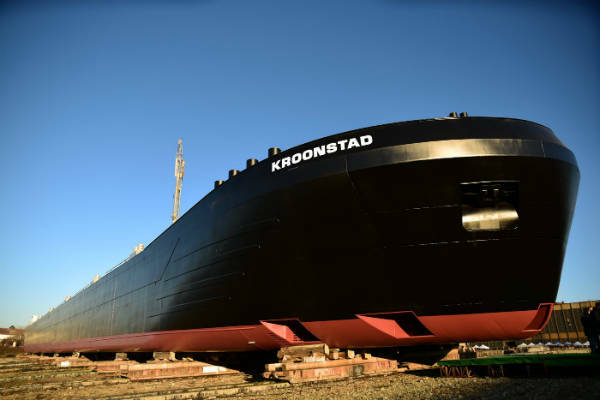 Watch the video of the launch of the MTS Kroonstad at the shipyard of RensenDriessen. Read more about our heating systems for inland navigation.